The most realistic, intelligent and effective smart trainer on Earth. The Wattbike Atom is the ultimate indoor bike. This fully connected, smart trainer enables cycling enthusiasts and professionals to train effectively without even leaving the house. From reaching speeds of 100mph to climbing some of the world’s most challenging courses, Atom accurately replicates the resistance and sensation of riding on the road. Ergonomically designed for riders between 5ft1 to 6ft5, the Atom, with its focus on ride realism, provides a seamless transition from indoor to outdoor. It is fully adjustable to closely replicate real bike positioning with integrated gear shifters placing the controls where riders expect them. For use with any tablet or smartphone device, Atom connects to all major apps and platforms through Ant+ and FE-C allowing riders to effectively track performance and gather data from their virtual rides. We believe disruptive design can only come from a deep understanding of our client’s brands, their market and, most importantly, the users. So we take time to create research programmes that explore the real-world pressures and aspirations of users. With Atom, we worked closely with Wattbike’s engineers, sports scientists and world-class athletes as well as other brands and cycling enthusiasts to devise a clear development road-map. From this solid building block we can then go on to create a truly disruptive product that engages users. By focusing on the user, we take pride in our ability to craft designs that best fulfil their needs. With Atom, Wattbike’s ambition is to bring the track indoors offering users the most realistic and uncompromising ride available at home. This means that users are after a trainer that is as much a statement of performance and speed as it is a tool to enhance their technique. As we refined the concept for Atom, we went from sketching and 3D modelling to using hand techniques so as to accurately explore form and function. During the development process we had to ensure that the engineering solutions devised would meet and exceed customer exceptions. 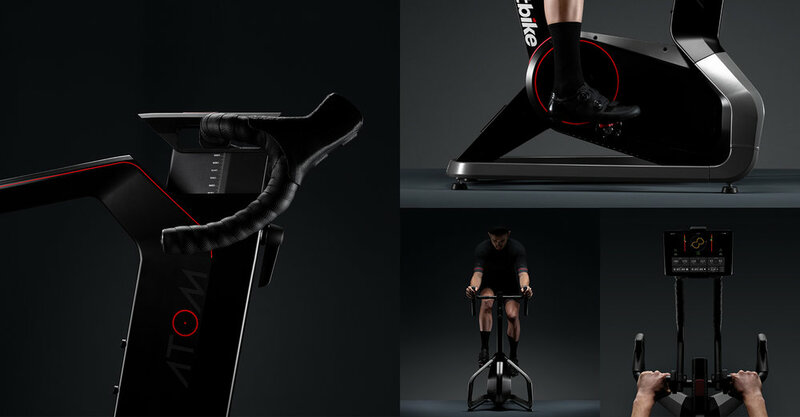 Working closely with Wattbike’s in-house teams and leading manufacturers, we proactively encouraged new lines of thinking to help create this truly disruptive product that would resonate with users. Atom was an instant hit when launched during The Cycle Show at Birmingham’s NEC in 2017 and has since been featured throughout the international cycling press. In 2018 it went on to win an iF DESIGN AWARD, one of the most prestigious and largest design competitions in the world. Over 6,400 entries were submitted from 54 countries and it was the task of a 63-member jury, made up of independent experts from all over the world, to select the winners. Our team attended the ceremony at the BMW Welt in Munich together with representatives from Wattbike to receive the award in the Sports/Outdoors/Bicycles category. "It has been an amazing journey and we are very proud of the outcome, that so closely matches the conceptual vision that we had crafted. The end result is a fantastic, feature rich product, that offers consumers a true bike like experience in their own home." "The Atom represents a radical step forward for Wattbike. Our first true home trainer, aimed specifically at cyclists, it serves the needs of the connected rider yet retains at its core our commitment to creating the most technically and scientifically advanced products in the world for improving performance." "Looks like a great product at just the right price. If someone wants to spend £1k on a high end turbo, they might as well go the extra £500 on the Atom and protect their precious road bike. I’m sure it’ll be a great success." "Loved it. Very pleased to have ordered before the show! Now just need delivery! Great piece of kit!" "That is a thing of beauty!."